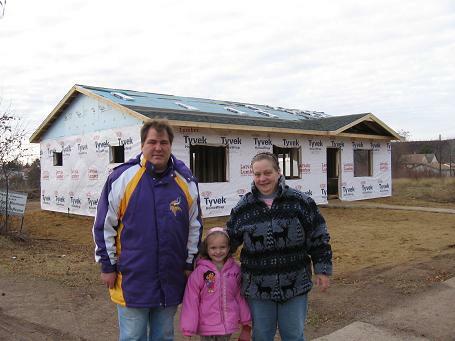 The VanAnda's home is being build in partnership with the Chisholm, Hibbing and Nashwauk-Keewatin High Schools and the Hibbing Community College through the Applied Learning Institute. The students used the home project as their class room, learning the construction trade from the foundation to the finish work. Many thanks to our Habitat for Humanity home sponsors: Security State Bank, US Bank, Wells Fargo Bank and Foundation, the North East United Way, the United Youth for United Way, and all the individuals, businesses and churches that support Habitat's work with money, time and tallent. Through the Wells Fargo Foundation partnership the volunteers will also be bringing a $10,000 check to support the project along with their hammers and tool belts! Thanks Wells Fargo! The Van Anda's Moved in July 2010. They've enjoyed settling in to their new home.